This is Sotogrande, Andalucia’s largest privately-owned residential super-estate. And super it most certainly is. Sometimes described as Spain’s ‘millionaire’s playground’, the enclave was purpose-built for a wealthy cosmopolitan crowd with the added bonuses of 24-hour security, designer boutiques and quality restaurants. My first introduction to this LA-like location came via a lifelong Soto resident who struggled to end a sentence in anything other than ‘dahling’, ‘sweetie’ or ‘fabulous’. You could have mistaken her for being too posh to pass the time of day. But within 30 seconds of meeting her, preconceptions melt away. And it’s the same with Sotogrande, an uber chic urbanisation in the municipality of San Roque. The bluer-than-blue marina, stacked with gin palace yachts and sailing boats galore, is the backdrop to a multi-coloured enclave of luxury apartments, villas and mansions. Gigi’s has been Soto’s happening chiringuito since it set up awnings three years ago, but you won’t catch Gigi or her business partner Cristobal boasting about their long list of regular royal visitors, sports stars or celebrity clients. “Sotogrande is where the wealthy come to relax in peace, they’re not here to show off or be seen, it’s very low key,” continues Gigi, whose father is from London. Perhaps this helps explain why the resort’s economy has consistently outperformed its Costa neighbours. 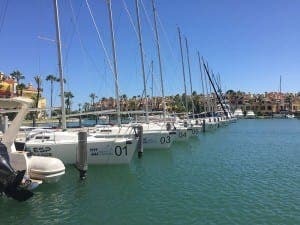 Throughout the last crisis, while areas like Fuengirola saw property prices plummet by as much as 11%, in Sotogrande they remained stable and even increased, some well into the double figures. And while the grapevine may have you believe the area is full of snooty money-makers, scratch beneath the tranquil opulence and you will find a down-to-earth, sporty community ready to welcome visitors with open arms. “There’s such a community spirit here,” confirms new resident Sue Davies, 51, who relocated with husband Wayne last August. While sailing has long been an obvious pastime for residents, the sports scene has always been ahead of the curve. Padel tennis, Europe’s fastest-growing sport, has been a Soto favourite for years. It is also polo’s most southerly European home. The big summer tournament at Santa Maria Polo Club in August is almost as famous for its pop-up shopping village and Grey Goose vodka after-parties as the gladiatorial sport itself. That’s largely thanks to the scores of royals and Spanish celebrities who come for the month to spectate and join in when they fancy it. The resort has been tagged with the brand of exclusivity ever since it was first developed by multi millionaire Joseph McMicking in 1962, after he fell in love with the location on a chance trip to Spain with his wife. A Who’s Who of kings, princes, sultans and aristos followed in their footsteps and bought homes or rented villas here, including former UK Prime Minister Tony Blair, Glenn Hoddle, Eddie Jordan and the current and former Chief Ministers of Gibraltar. Princes William, Harry and Andrew, Fergie, Duchess of York and her daughters, the princesses Eugenie and Beatrice are all familiar faces at Sotogrande polo. Then there are A-list visitors like Rod Stewart, Mariah Carey, BBC’s Nick Knowles and Genesis’ Mike Rutherford, who have all sought a low-key break in this exclusive enclave. On any good day you might also spot 73-year-old Robin Byers cruising around the puerto in his 1978 blue beetle convertible. 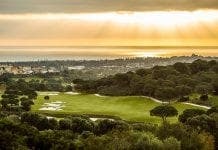 “I have travelled around the world and I can say with confidence that there’s not a development in the whole of Europe that rivals Sotogrande,” he tells me. “When you think of Monaco or St Tropez, they don’t have all the sports that we do and they don’t have Gibraltar and Andalucia on their doorstep. 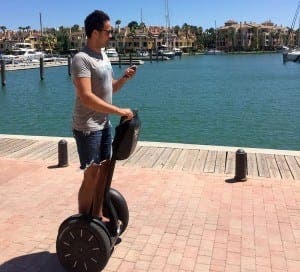 Indeed you can’t help but feel at peace when strolling around the marina, although make that Segwaying around the marina. Personal transporters are the in thing here, whether it’s workers zooming to the office, coffee in hand, or hipster teens taking turns on motorised skateboards. 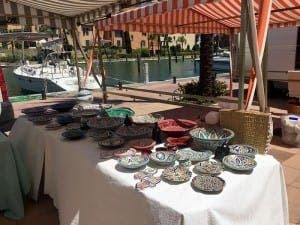 After dodging the two-wheeled-speedsters, you might want to check out the port’s bustling Mercado de Levante flea market. From ceramics to vintage fashions, everyone is welcome under the candy-striped awnings that pop up along the quayside. And following on from last year’s success, the convoy of food trucks representing Soto’s finest eateries will offer even more choice this summer, with permits to set up alongside the market’s pop-up stalls as well as down at the polo club. Unfortunately, in search of respite from the Soto sun, I found the gelato truck was closed so I had to settle for a cerveza. But I was spoilt for choice, with high quality café’s, bars and restaurants on every corner of the port. 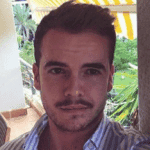 At The Hairy Lemon, a favourite expat haunt, I got chatting to James Eden, 38, from Kent. “Soto has a great ambience, and we love coming here to get away from the bustling coast,” he explains. “It’s obviously a bit pricier but it’s worth it, and my wife likes the shopping. 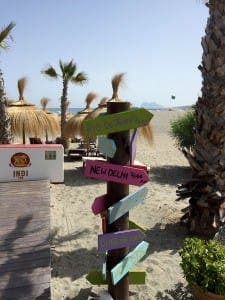 Despite its upmarket nature, this enigmatic resort 25km east of Gibraltar is full of mostly down-to-earth and warm-hearted people. “You don’t have to be a snob to get on in Sotogrande, people aren’t like that here,” Sarah Smith, 51, tells me as she watches her son at padel tennis training. 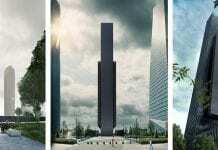 “To be honest it’s nowhere near as flashy as Marbella where people like to show off their wealth. 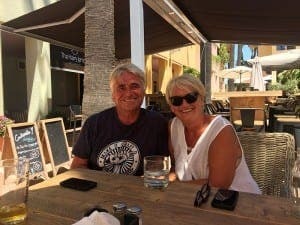 Her words resonated as I drove through Sotogrande’s leafy avenues to Galerias Paniagua, the bijou commercial centre where the residents buy their foreign newspapers and paperbacks and can eat out when they don’t want to cook in. 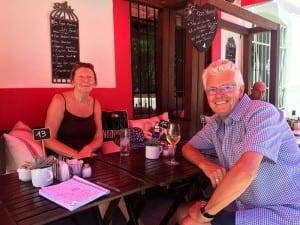 Graham and Jane Astle from Cheshire were enjoying a late lunch at cool new eatery, Petit Bistro. Of that I certainly concur. Maybe it’s the tranquility lacking in Marbs or Banus, or perhaps the beautiful views of Gibraltar from all around. 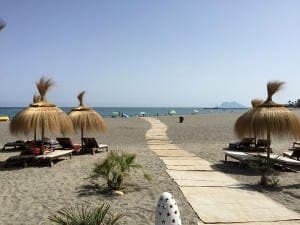 Aside from its sports and family-friendly beach bars, Soto also has nice beaches to relax on. And had work not beckoned the following morning, it’s more than likely a cabana and cocktail session would have been calling my name. Perhaps next time. I left Soto reluctantly, sad that I couldn’t stay longer, jealous that I wasn’t part of this close-knit community. But I’ll be back and, having met a whole cast of hospitable residents, I know that I will be welcomed as if I were one of their own. Next articleWhat is the official language of an Annual General Meeting in Spain?